Family Classics – Fun with music! This annual celebration of some of the greatest classical works is presented specifically for the young and the young at heart as an introduction to live classical music but with plenty for the experienced music-lover to enjoy. Compèred by the irrepressible Kevin Hathway and conducted by Jonathan Willcocks, the full forces of Guildford’s professional orchestra Southern Pro Musica are standing by to entertain you and your families in characteristically enthusiastic style! 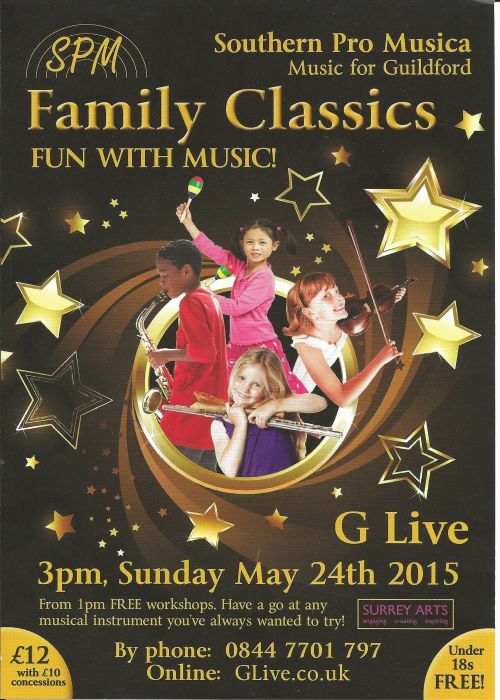 Audience members for Family Classics are encouraged to join in the fun from 1pm when Surrey Arts presents a series of informal workshops around G Live, offering the opportunity to try a huge range of musical instruments with expert guidance and absolutely free!